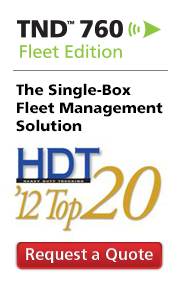 Now there’s a better way to get the most out of Rand McNally’s mobile fleet management solutions. The all-new Rand McNally Connect web portal, the command center behind the TND™ 760 and TPC 7600, was released earlier this month. The new portal includes enhanced reporting and analysis, a single dashboard for features and services, and new partners. The dashboard allows fleet managers to see trends and key performance indicators quickly, and then to drill into business issues via detailed reports. Plus, the new portal offers: “Our goal with the Rand McNally Connect web portal is to provide a scalable management platform for our customers’ operations. From a single sign-on, managers and dispatchers have a seamless portal that will manage not only Rand McNally mobile devices but incremental, value added services our customers will find integral to managing their operations such as fuel tax, CSA scoring and others,” said Jim Rodi, Senior Vice President, Mobile Communications, Rand McNally. Dynamic mapping, which combines location intelligence with a visually based user interface, featuring a robust set of geo-spatial tools that allow a “war room” like user experience. A Geofence program that allows complex polygon “fences” to be drawn around customer locations, terminals, routes, and more, enabling alerts and reports on vehicle activity. A POI Manager, which saves important locations to the mapping interface, is ideal for viewing customer locations, terminals, and more. The value added services available directly from the new Connect web portal will pull data from the Rand McNally mobile fleet management devices and provide insight into business challenges such as driver behavior/CSA scoring, fuel-tax reporting, and event analysis for improving training and safety. 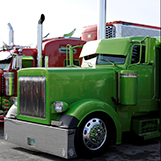 Will you be at the Mid-America Trucking Show March 21-23 in Louisville, Ky? Come by booth# 68144 where Rand McNally will be showcasing the IntelliRoute® TND™ Truck GPS, with 35% more truck routing information than other GPS units. We’ll have drivers present to tell you all about how they use the TND™ 720, loaded with features and content for the professional driver. Also at the Mid-America Trucking Show, we will be sharing some exciting news at our press event taking place Friday, March 22 at 11 a.m. in room c-109. Plus, make sure to check out our Seminar on Routing Saturday, March 23 at 2 p.m. And, we will be selling our IntelliRoute TND™ products, offering a daily drawing for an IntelliRoute™ TND™ 720 truck GPS, and demoing the TND™ 760. Later this year, Sen. Charles E. Schumer and the Federal Motor Carrier Safety Administration (FMCSA) will launch a national campaign to reduce costly and dangerous low-bridge strikes through new training and safety visor cards. The visor cards will offer official recommendations to members of the commercial trucking industry on the proper use of GPS devices, and training on such will be incorporated into new entry-level certification programs for commercial motor vehicle operators. Schumer and FMCSA Administrator Anne S. Ferro announced the new campaign from the Eagle Avenue overpass in Long Island, N.Y. on March 11. The overpass has been struck at least 27 times by trucks that are prohibited from driving on the parkway, and represents the importance of the proposed education and training for drivers. For more than 70 years, Rand McNally has been working to meet the specific needs of the commercial transportation industry. That’s why our entire line of IntelliRoute® TND™ truck GPS devices offer 35% more truck-specific data than other GPS devices. Plus, when we created the TND™ 760 and TPC 7600 to serve the industry’s mobile fleet management needs, we also equipped these devices with the same award-winning truck-specific navigation drivers already know and trust to help keep themselves and their trucks safe and efficient. 1 Schumer, Administrator Ferro Announce Major Federal Steps to Reduce Dangerous, GPS-Caused Bridge Strikes – Hundreds of Oversized Trucks, Buses Hitting Low Bridges on Highways Due to Proliferation of Low-Grade GPS Devices.